The Rocket Brigade at Leipzig 1813 – The Decisive Psychological Weapon? The Battle of Leipzig 16-19 October 1813, was the largest battle of the nineteenth century, and fought between the Prussians, Russians, Austrians and Swedes and French under Napoleon. The only mention of that the Emperor Napoleon makes about the course of the battle Leipzig, is that his forces were heavily outnumbered, but the allied victory would not have been as decisive if the Saxon Army had not defected to the Allies in the middle of the battle. The Rocket Brigade RHA (now O Battery (the Rocket Troop) RHA,) was the only British unit to take part in the battle of Leipzig. This experimental unit played a part out of all proportion to its size and numbers. It may have played a key role in the surrender of the Saxon troops that gave rise of Napoleon’s bitter comments. 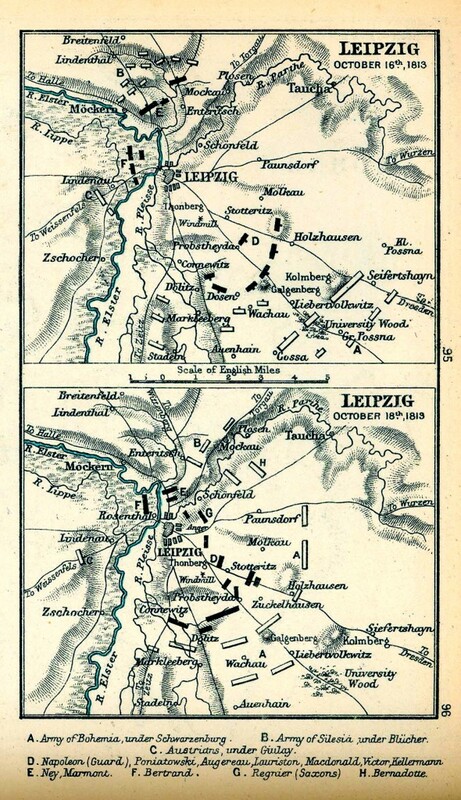 The Rocket Brigade RHA were at the Battle of Leipzig almost by historic accident. They were an experimental unit tasked with conducting what might be regarded as an operational test of the Congreve rockets on land. Asian armies were using rockets for military purpose since the thirteenth century. By the time the British East India Company was fighting wars against the Indian states in the late C18th, rocket technology had developed. By using metal, rather than paper, cases the range of military rockets was extended from c.500m to c. 2,500m. The Armies of Mysore equipped with these caused problems for the British, including inflicting a defeat at Battle of Pollilur (1780). At the invitation of the Admiralty, “to develop stores for the annoyance of the enemy” Colonel Congreve at the Royal Arsenal at Woolwich developed a range of rockets, which are known by his name. These included rocket projectiles in different sizes from 6 pdr to 48 pdr and a sophisticated range of natures including solid shot,. Shell, incendiary carcass, case shot (shrapnel) and even illuminating parachute flare. The advantage of a rocket is that it does not need a heavy ordnance to launch it, allowing for a much larger weight of projectile. Rockets had a psychological effect, particularly on animals or those unfamiliar with the weapon. The disadvantages were the inherent inaccuracy of the rockets. This could be overcome by launching them en masse, the solution adopted even in WW2. After the fall of Seringapatam, the British found 600 launchers, 700 serviceable rockets and 9,000 empty rockets. The Royal Navy made use of rockets to bombard ships in harbour, at Boulogne and Copenhagen. The inherent inaccuracy of rockets resulted in the town set ablaze along with docks and ships, and scepticism about rockets within the army, including by Arthur Wellesley, in command of the army in the Peninsular. None the less, in September 1811 an experimental unit was established at Woolwich to test rockets for land use, formed of 30 gunners under the command of Captain Bogue RHA. Described as “one of the handsomest man of his day and a friend of the Prince Regent” (1) Bogue had served in the Corunna campaign with B battery RHA. By May 1813 the Ordnance board had decided that everything that could be discovered from exercises had been extracted and that a trial would be needed on active service. The experimental unit would be brought up to strength for service in the field as the Rocket Brigade RHA. 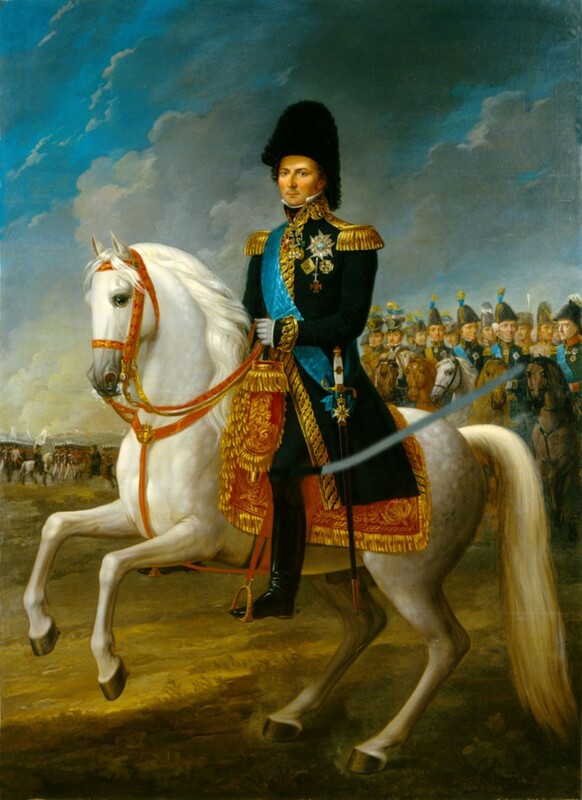 The opportunity arose in the spring of 1813 after Napoleon’s invasion of Russia. By the time the Rocket Brigade had landed in Stalsund on the Baltic coast of Germany the sixth coalition against Napoleon included Britain, Austria, Russia, Prussia and Sweden. The Rocket Brigade would join the Army of the North under the Crown Prince of Sweden. 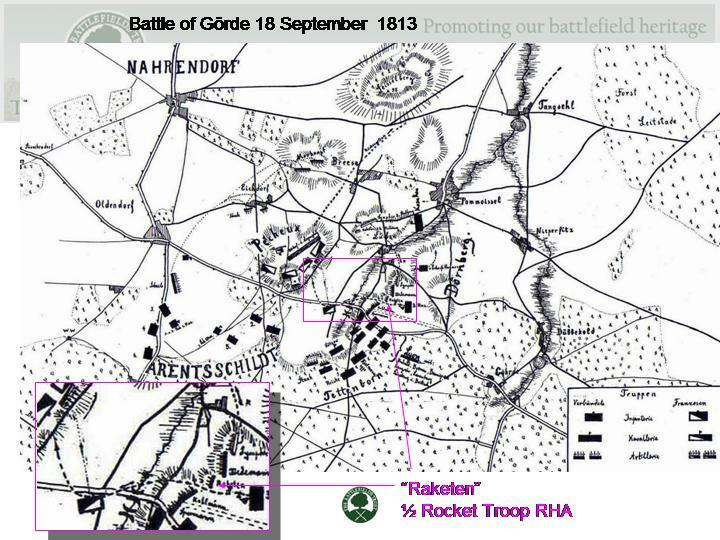 The Rocket Brigade’s first action was on the 18th September 1813 at the battle of Görde North West of Danenberg in what is now Lower Saxony. 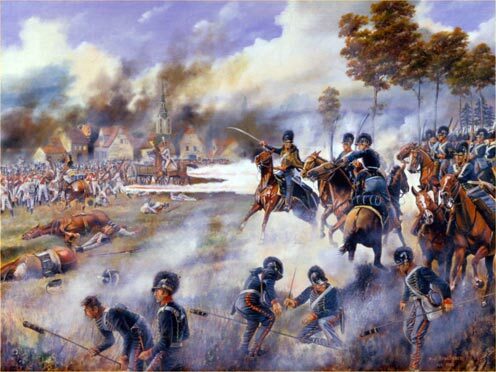 Half of the brigade took part in the battle in which an allied force of Hannoverian, Prussian and Russian troops destroyed a French division advancing South from Hamburg. After the battle they rejoined the other half of the Brigade with the Army of the North at the siege of Wittenberg. Their guide across Germany was an officer of the 5th Battalion the Kings German Legion, who became the only member of the KGL to be present at the Battle of Leipzig. “at the commencement of the action on the morning of the 18th, Captain Bogue addressed himself to General Winzingtrode, commanding the advance of the Crown Prince, expressing his desire to see the enemy and requesting permission to engage. The General much taken with the gallantry and spirit of the address, granted as a guard a squadron of dragoons and requested Captain Bogue to follow his own plans and judgement. Captain Bogue lost no time in advancing to the village of Paunsdorf, then in possession of five of the enemy’s battalion, upon whom he opened, in advance of the whole army, a most destructive fire. This was returned by musketry and for a time a very hot combat ensued, which the enemy , unable to withstand the very well directed fire of Captain Bogue’s brigade fell into confusion and began to retreat. Captain Bogue, seizing the moment, charged at the head of the squadron of cavalry, and the enemy terrified of his approach, turned around and taking off their caps gave three huzzas and , every man to the number of between two and three thousand, surrendered to the Rocket Brigade, which I believe did not exceed 200 men. Not everyone saw Congreve’s formidable weapon as an unmitigated improvement in warfare. Dr Wenzel Krimer, was a surgeon in a Prussian Reserve Infantry Regiment, commented. The Terrible Effects of the Congreve Rockets. Colonel Hermann von Boyen was Chief of Staff for General von Bulow’s III Corps, the lead troops of the Army of the North. He described how, as soon as the Army of the North came into the battle line, a heavy artillery-duel began. “About an hour later the French advanced from the so—called peasants’ houses with a column made up of two or three battalions and appeared to be heading for the Swedish corps which stood some distance back. In support was the English rocket battery under Captain Bogue. This gallant soldier immediately went forward undaunted with his battery against the enemy column and came so close that before he could open fire an enemy sharpshooter shot him dead. However, his subordinates were not dismayed by this loss, and the rockets produced a most unusual effect near where they were ignited. The French column, which hitherto had been advancing in very good order, even if latterly with a shorter step, was utterly dispersed just as occurs when one breaks up an ant heap with a blow, and it ran in total disorder back towards the peasants’ houses, amid our almost universal laughter. What happened at Paunsdorf on 18th October 1813? The French troops opposing the Rocket Brigade in the afternoon of 18th October were from General Reynier’s VIIth Army Corps. These comprised two divisions, and C 30 cannons. The 24th (Saxon) Division commanded by General zon Zeschau, comprised of two brigades. One under Colonel v Brause, of five Battalions and a second under General von Ryssel, of three battalions, and the 32nd (French) Division under General Durutte, of six battalions organised into two brigades. The Saxon division has been estimated at a maximum of 4,200 men with no more in Durutte’s division. The Royal Saxon Army, were from the part of Germany where much of the 1813 campaign had been fought, and now overrun by Napoleon’s enemies. The Saxon officers had formed the opinion that the campaign was lost and the best course of action would be to defect to the allies. The French had already become distrustful of their Saxon allies. The 24th (Saxon) Division under General Von Zeschau had been ordered to march to Torgau, NE of Leipzig. The arrival of Austrian and Russian troops of the Army of Silesia and the Army of the North had blocked that move. As a consequence the Saxons deployed around Paunsdorf, which had been garrisoned by a battalion of French soldiers from Durutte;s 32nd French Division and two companies of Saxons on the Morning of 18th . Von Brause’ Brigade of five battalions was deployed across the road to Taucha West of Paunsdorf, and von Ryssel’s Brigade of two battalions and a jaeger company near the Windmill at Stuntz. Three batteries of artillery were deployed between Stuntz and Paunsdorf. Five out of six of the six battalions forming Durutte’s French 32nd Division were deployed formed in the area around Sellerhausen. During the morning the Austrian Army 2nd Advance Guard Division made repeated attacks on Paunsdorf. With support troops from Durutte’s division the French hung on to a position in the village or close to it until around 2 pm. The fire from the French Saxon artillery seems to have been effective in suppressing the Austrian artillery, killing or wounding artillery detachments and horses. This changes with the arrival of the Prussian troops from the army of the North attacking from the NE and the Rocker Brigade. There seem to have been three stages in the Rocket Brigade’s actions. First, acting on his own initiative Bogue deployed rockets against the “five Battalions of the enemy defending Paunsdorf”. This, in conjunction with an attack by infantry resulted in the defenders fleeing. Third, on the orders of the Crown Prince of Sweden, the Rocket Brigade engaged troops near Sellerhausen. Here the battery comes under fire, Bogue killed, and the battery continues to engage the French under the command of Lt Strangeways. What part did the Rocket Brigade play in the defection of the Saxon Army? 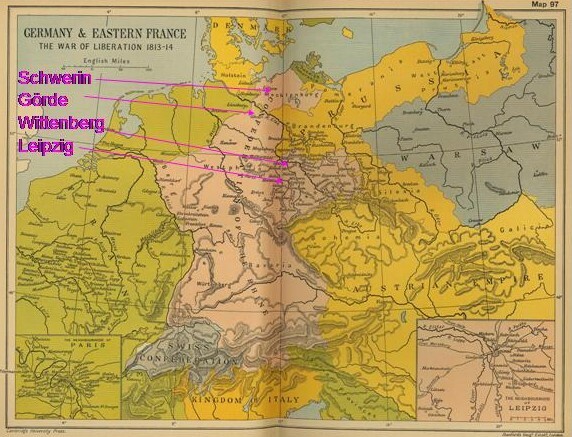 At some point in this area, during the Rocket Brigade action the majority of the Saxon Army defected to the allies. Digby Smith includes a lengthy account sympathetic to the Saxons, apparently based on accounts by someone with von Ryssel. The Saxons were keen to avoid abandoning their artillery and artillerymen to French retribution. They also preferred to surrender to the Austrians, Russians or Swedes than to the Prussian who they saw as keen rivals. This account describes the defecting Saxons marching East from Stultz, out of contact. That might explain the defection of von Ryssel’s Brigade. 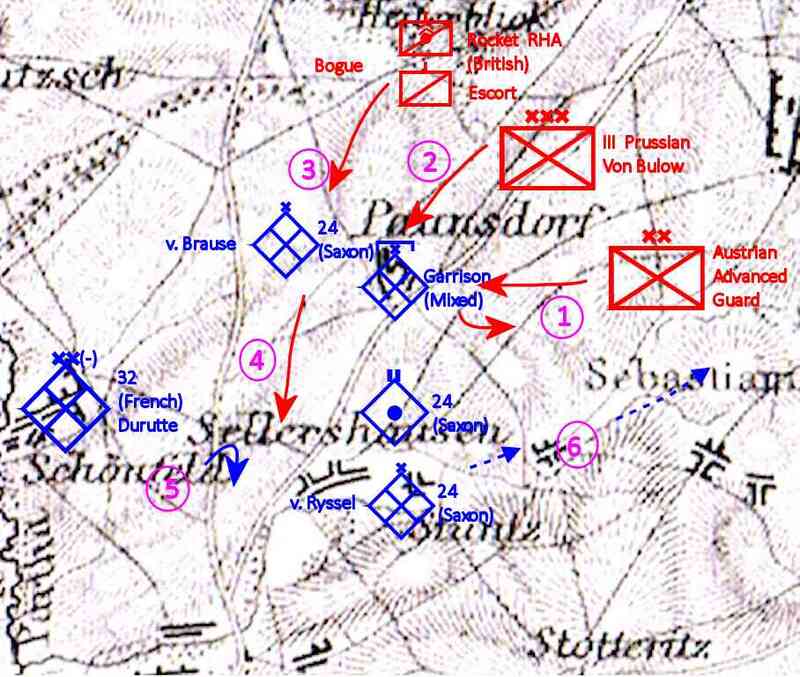 But how did von Brause’s Brigade, committed to the defence of Paunsdorf disengage and defect? Were these the troops that James wrote of as greeting their mounted pursuers with three Huzzas? Perhaps this was an announcement of a defection rather than the surrender of a mob. Otherwise why would an infantry unit organised enough to organise three cheers find more security in a square bristling with bayonets? The five battalions of this formation might add up to the 2,000-3,000 prisoners mentioned by James. Did the presence of the Rockets give the Saxons an opportunity to defect? The British Joint Operational Research from WW2 found that German prisoners of War reported that rocket projectiles fired from aircraft was one of the more terrifying experiences. Despite Saxon disillusionment with Napoleon’s cause, Von Brause’s men seem to have fought determinedly at Paunsdorf – until under fire from the Rocket Brigade. 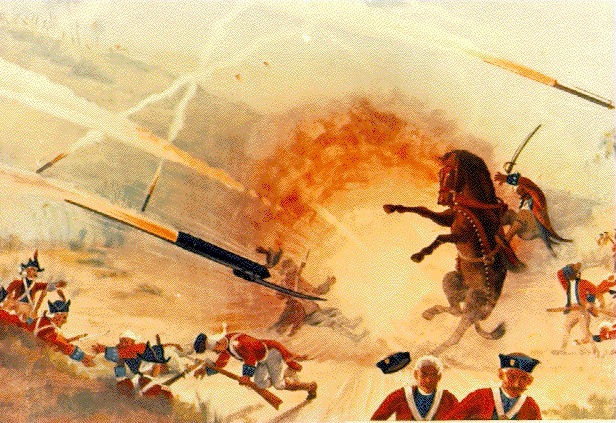 The Rocket Brigade started with a strength of 142 officers and men, over 100 horses horses, four women and two children. During the battle of Leipzig the Brigade’s casualties were one officer and one man killed, six wounded and 26 horses killed and wounded. The Rocket Brigade was not involved in the Battle on the 19th of October, but spend the day buring their dead. 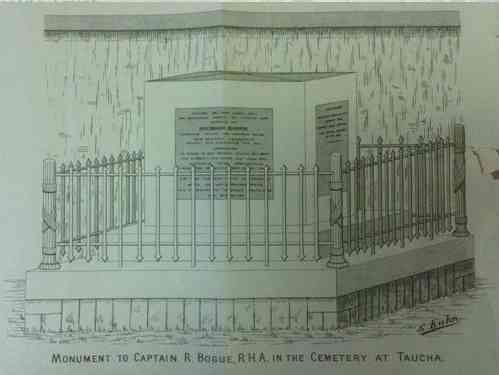 Richard Bogue was buried in Taucha churchyard, four miles away from where he fell, and a stone monument was erected over his grave in 1815 by national subscription. As the nineteenth century drew to a close the grave was found to have fallen into a state of neglect, but on this fact being made known members of the Bogue family and officers of the Royal Regiment of Artillery contributed money for its restoration. 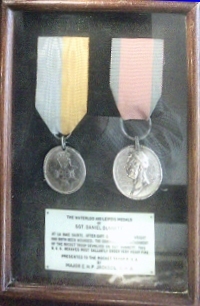 Leipzig and Waterloo medals awarded to Sgt Dannatt of the Rocket Brigade who served in both battles. In January 1814 the Crown Prince of Sweden sent the Swedish Military Order of the Sword, 4th Class (Knight) to Captain Bogue’s widow, and also a gift of 10,000 dollars. Six years later, he, as the King of Sweden awarded silver medals of the same Order to Sergeants Michael Taylor and Robert Chalkley, Corporals Edward Marks and William Wareham, and Bombardier John Guy. The reverse of each medal bore the inscription ‘FÖR TAPPERHET I FÄLT (‘For bravery in the field’). These medals were the first medals for bravery issued to British Soldiers. The Rocket brigade was also given the battle Honour “Liepzig” and adopted as a battery Honour Title after the Royal Artillery adopted “Ubique” (Everywhere) in place of individual Battle Honours. A descendant of Captain Bogue, happened to read the piece in the Daily Telegraph about the talk on Leipzig for the Battlefields Trust. 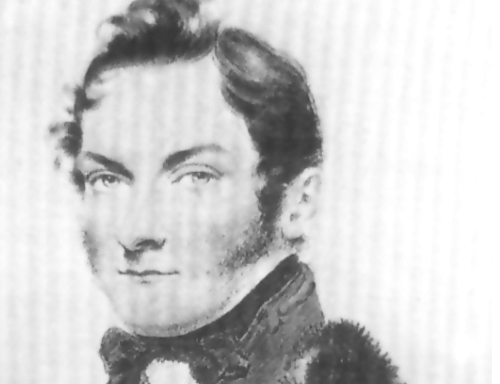 Bogue’s descendant also called Richard, has in his possession Captain Bogue’s papers, including his Journal, and the letters sent to Bogue’s widow by the Prussian General Prince Blucher, and The Swedish Crown Prince Carl Jean. He also inherited Bogue’s nine volume travelling works of Shakespeare that accompanied him on campaign. This and Bogue’s journal gives an insight into the character of a highly professional officer, whose decisions made a difference. He was also a cultured man, commenting in his journal on the tomb of Thomas a Becket and Saxon church architecture. 170 years after Liepzig an Ex Battery Commander of the Rocket Troop exorted the officers of his regiment to have professionalism, polish and panache. Richard Bogue RHA epitomised these qualities. (This is the first of two posts based on the research for the talk given on behalf of the Battlefields Trust at the Fusiliers Museum at HM Tower of London on 15th October 2013. The Second part will cover the story of the Rocket Troop that fought at Waterloo, and ask why it is missing from many accounts of the battle) . Letter from Lieutenant John James held by Mr R Drake copies in Firepower and O Battery. Adramelach was an Assyrian god to whom children were sacrificed on a fire.